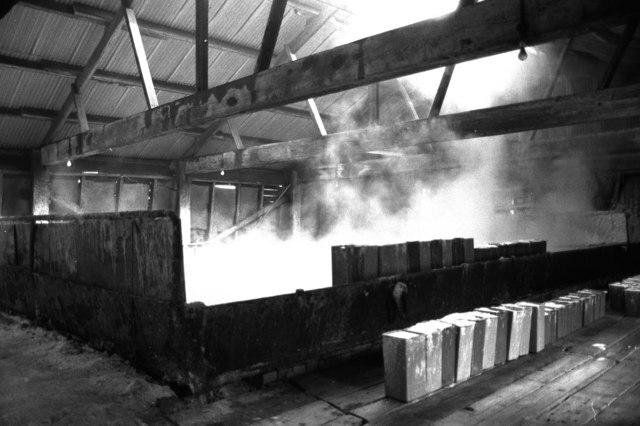 This was the last large open pan salt works in the UK and used pumped brine. There is a small sea salt operation at Maldon but it can't match this for atmosphere and they don't allow visitors. The pan is working, hence the steam and the salt crystals were skimmed into the moulds that can be seen on the side of the pan (being filled) and on the floor in front (full). This was real history in the making. The site is being conserved but it will never be the same again. © Copyright Chris Allen and licensed for reuse under this Creative Commons Licence. This page has been viewed about 404 times.